93% efficient means considerable savings in gas, cooking oil and raw material use. 40% in cooking oil usage. (Based on Hewigo customers’ actual experience). Increases in cooking speed give far greater cooking capacity than a standard range of similar size. More heat is productively used so less heat in the shop – greater comfort for customers and staff. Lower emission of poisonous fumes and carbon gases – makes a significant contribution to environmental protection. Flexibility of control in all sizes of outlets. Hewigo's considerable experience with this technology ensures you have the most advanced products in this category. Prices well below those of immediate competitors so you will benefit from an investment that is realistic for your business. 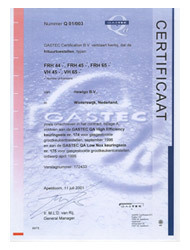 Efficiency figures certified by Gastec. The unique design of the Hewigo High Efficiency burner means that all the heat is driven upwards to the pan above such that the burner retains no heat. To demonstrate the hand can be placed safely onto the burner immediately after the burner flame is extinguished. However high efficiency burners are not the only contributor to potential energy saving. Hewigo have introduced a number of other improvements to help the operator. Sensitive digital control is available and can be combined with touchscreen technology if required for even more sensitive and visible control. It can also be linked to a frying management system to give both information and diagnosis. Here Hewigo customers can opt for three-stage filtration. In addition to the standard coarse and fine crumb filters, the returning oil is now sucked under pressure through a third micro-filter. The result is a refinement of the oil such that it retains its optimum performance up to three times longer. Though readily available in 300w and 200w sizes, there is a problem. The 200w is too short and does not give good light coverage. The 300w is too powerful and can burn the food. If you turn down the heat the cabinet is not illuminated sufficiently.